Brother Kian got a spot. He added a few more – about 11 in total – that scabbed immediately then disappeared. We barely recognised it as Chicken Pox. 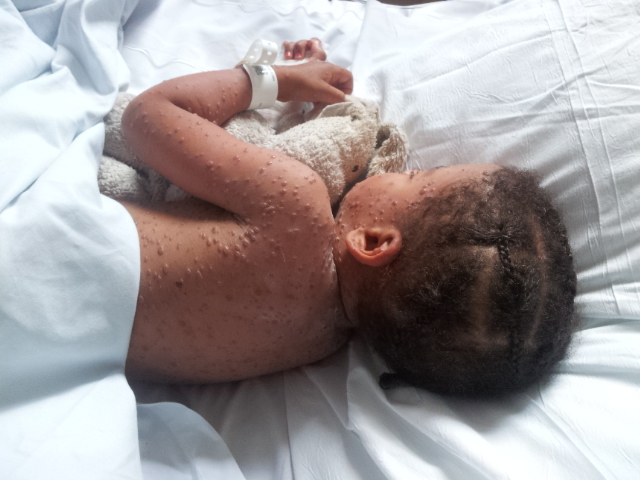 They threw a skin rash at her, then a virus swelling her tonsils, and then came the huge Pox. All over her. Her palms and scalp and in between her wee digits. Her temperature soared to 41 deg and she became listless and without appetite. All hope of having a pox party for her birthday (the night after her fundraising quiz) were dashed as her mum got an ambulance to take her to hospital – on her birthday itself, Saturday 13 July. She only emerged from isolation in Croydon University Hospital last night. Her and Mum had spent 5 days in a roasting room without curtain to block sunlight, nor fan apart from our own supply. This hardly helped her recovery. The Pox was still creating new spots in the very few spaces they had left up until Wednesday when her temperature was finally brought under steadier control. Now at home and on strong and frequent nasty-tasting meds, Caitlin can start to look forward to the party she had to postpone last weekend. Thank you for all your kind words and support and for thinking of her. It’s been a very busy and worrying time and though currently off her feet, she is making steady recovery.